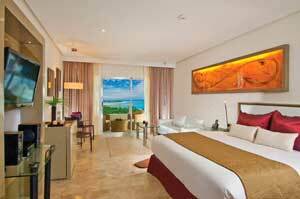 Paradisus Playa del Carmen La Esmeralda is a luxurious, all-inclusive resort, located in Riviera Maya. Combining a prestigious Caribbean setting with world-class facilities, including Family Concierge, the ultimate in spa treatments and flexible meeting spaces with state-of-the-art equipment, this resort offers guest deluxe facilities in a relaxing ambiance. This elegant, LUXEclusive® resort has a Mayan ecological feeling and an oceanfront location, surrounded by a lush tropical mangrove preserve and in view of Cozumel Island. The beautiful beach is accessed via quaint bridges that span the lush mangrove area in front of the resort. Boasting eleven restaurants serving delicious cuisine from all around the world and ten bars serving unlimited international premium brand drinks, Paradisus Playa del Carmen La Esmeralda is sure to please even the most selective palette. Located in a stunning little bay, Paradisus Playa del Carmen La Esmeralda for Families is a superior luxury resort in the Riviera Maya, combining a prestigious Caribbean setting with world-class facilities, including Family Concierge, the ultimate in spa treatments, a relaxed ambiance, and flexible meeting spaces with state-of-the-art equipment. This elegant LUXEclusive® resort has a Mayan ecological feeling, and an oceanfront location surrounded by a lush tropical mangrove preserve and with views of Cozumel Island. The beautiful beach is accessed via quaint bridges that span the lush mangrove area in front of the resort. Take your senses on a culinary tour through eleven remarkable restaurants serving delicious cuisine from all around the world and ten bars serving unlimited international premium brand drinks. Enjoy life-enriching experiences such as tango dance classes, sushi-making, and sensorial experiences. 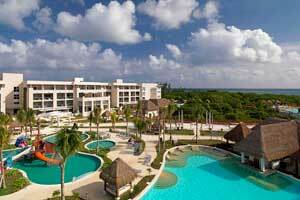 This luxury family-friendly All-Inclusive resort is located about 45 minutes from Cancun International Airport and just steps from an extraordinary beach and attractions such as Playa del Carmen’s 5th Avenue, Xcaret, Akumal, Xel-Ha, and near world-famous Mayan archaeological sites such as Tulum, Chichén Itza and Cobá. Guests will receive preferential rates at Grand Coral gofl course! This offer is combinable with other promotions. Rates valid at the time of booking. Pure Freedom Instant Savings are per room per stay, non-cumulative. Pure Freedom Instant Savings last day to use will be December 22, 2019. This offer is subject to availability. The Hotel reserves the right to discontinue this promo at any time. The values for the individual savings/providers are subject to change at any time. The hotel will update any possible changes. Cancellation policy applies as per contract. Free sell. The rest of conditions remain as per contract. Breakdown and Suppliers may vary for 2019. The hotel will update any possible changes. Paradisus Playa del Carmen is excited to announce a brand-new waterpark at the family-friendly Paradisus Playa del Carmen La Esmeralda. The waterpark will be located outside the Kid’s Zone area and available to all guests of the hotel. Children from three to fourteen years old will go wild for this new water experience consisting of three pools, one of which includes five water slides and dumping buckets. The small pool acts as the splash pool for small toddlers. In addition to the waterpark, Paradisus Playa del Carmen La Esmeralda will also be incorporating new activities for children of all ages. These include, but aren’t limited to, new life enriching experiences for teens including an afternoon pool party, a new snack stand offering a children’s menu with healthier options, themed parties for families at the main pool and special surprises for the youngsters.